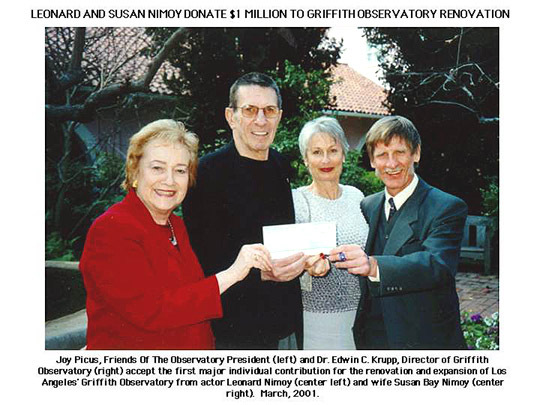 Friends Of The Observatory (FOTO) is honored to announce a gift of $1 million toward the renovation and expansion of Griffith Observatory by actor Leonard Nimoy and his wife Susan Bay Nimoy. The first major donation from individuals to the Observatory's capital campaign, the Nimoy's contribution adds to the nearly $42 million in funds raised to date for the project. At a cost of $63 million, the 2002 ? 2004 renovation and expansion project will be partially funded by voter-approved city and county bond measures, as well as contributions from other individuals, corporations, foundations, and the State of California. They both share a rare commitment to public astronomy and education, which led FOTO and the City to name the new lecture hall in the renovated and expanded Observatory the "Leonard Nimoy Event Horizon" in honor of their contributions. Located in the new lower level, this 200-seat, 2700 square foot auditorium will provide a modern venue for lectures, demonstrations and a variety of other activities, and will compliment the programming offered in the Planetarium Theater upstairs. "By observing the sky and pondering our place in the universe, people gain a new perspective on their daily lives," said Leonard Nimoy. "Griffith Observatory gives its visitors that opportunity. It is a Los Angeles icon, one which we need to ensure will be here for generations to come." "Like so many people in this area, we recognize what a powerful resource the Observatory is for the community," added Susan Nimoy. "When we learned of the plans for renovation and expansion, Leonard and I agreed that we wanted to make a substantial commitment, both personally and financially, to the project. I hope that our participation will encourage others to become involved." "We are so appreciative of the Nimoy's generous donation to our capital campaign," commented FOTO President, Joy Picus. "Leonard and Susan appreciate what Griffith Observatory has meant to the public since 1935 and why this renovation and expansion are so badly needed." Added Griffith Observatory Director Dr. Edwin C. Krupp, "As they have done before, the Nimoys are providing leadership for an important civic institution. We are overwhelmed by their incredible generosity and sense of vision." Hardy, Holzman, Pfeiffer Associates (HHPA) in association with Levin and Associates, are the architects for the renovation, restoration and expansion of the building, working together with the City and FOTO to help renew one of Los Angeles's most beloved landmarks. By excavating under a portion of the front lawn, Griffith Observatory will more than double its size, without affecting the classic exterior. In addition to the new "Leonard Nimoy Event Horizon" theater, project plans include extensive new exhibit areas, renovation of existing exhibit halls, an expanded bookstore, a new on-site food service, and an improved, state-of-the-art planetarium theater. Construction is set to begin in May 2002 and should be complete in late 2004. Opened in 1935, Griffith Observatory is one of the best known and most visited public observatories in the world. Operated by the City of Los Angeles's Department of Recreation and Parks, the Observatory has welcomed over 67 million visitors into the Hall of Science in its nearly 66 years of operation. Access to the Hall of Science and the rooftop telescope is free until 10 p.m. each night the Observatory is open, while high-quality planetarium shows are offered for a minimal fee.